PageRank algorithm is invented by Larry Page from Google. It caculate the probability that some random randomly clicking on links will arrive a certain page. A user will always stop clicking after a while. To capture this, PageRank algorthm also using a damping factor to indicate that there is a 85% chance that a user will continue clicking on links at that page. 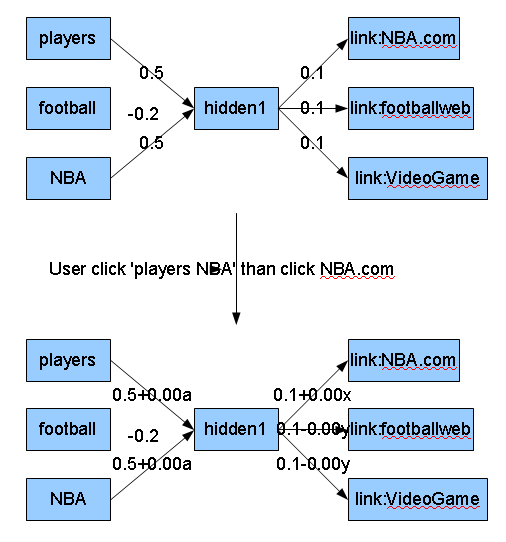 The above pic shows how PageRank algorthm works: User other page's pagerank values and proption that links link to a page to caculate the PageRank value of the page. A problem is how we know the pagerank of Page B,C,D. A method is to initial the PageRank value of all pages to 1.0. Then we recaculate those pagerank values one page by one page for several iterations, e.g. 20 iterations. 1. Word frequency: Count the times of all the words, which a user seached, appears in the webpage of a url. Then this is the score of this url. Caculate scores for all urls, and sort these urls by their scores. 2. Word location in document: If a page is relvant to a search term, it will appear closer to the top of the page. 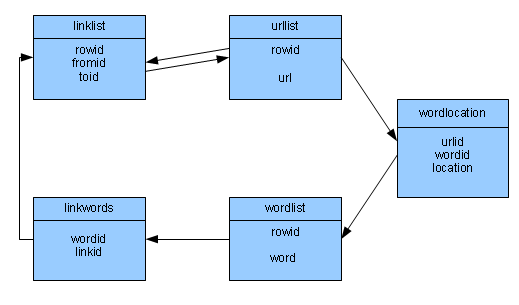 For the same urlid, there may be different combination of word locations. For each combination of this url, we can sum its locations and find the smallest one as the url's score. 3. Word distance: If the distance of all the different words in a url is shorter, then the page of this url tends to be more relvant to the search term. e.g "c programming language is a structured high-level ..." is more relvant then "C > A+B is a formula, in python programming lanugage, we can express it as... " when the user searchs "c programming language" because the distance of the first one is only two. Because I want to focus more on other page ranking algorthms, I will skip the implementation of the above algorithms.